Have you thought of buying a tablet? Well, then, chances are that you'll have been tempted by an iPad. The truth is that however good the rival Android or Windows tablets have been, it's Apple that has been calling the shots with the best-designed tablet around. Until now. Samsung's new tablet is slim, stylish and powerful. 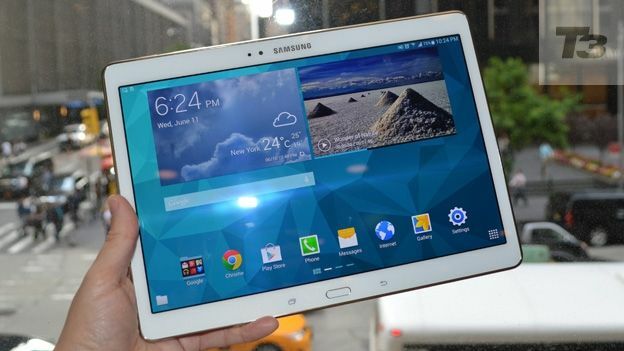 The Galaxy Tab S marks a new start for the company. After all, before now even Amazon's keenly priced Kindle Fire series and the well-specced Google Nexus 7 haven't been able to unseat the iPad Air and iPad mini 2 from their thrones. The iPad outgunned rivals when it added a Retina display. Samsung and others upped their screen resolutions to compete, only to be outdone again by the super-slim, preposterously light iPad Air. Apple stayed out in front. The Tab S at last gives the iDevices a serious challenge. The Galaxy Tab S comes in two sizes and both are easily the snazziest tablets Samsung has ever created - a night-and-day improvement over earlier models which had grey plastic as their most dominant style motif. That's gone, replaced by metallic-style edging and perforated soft-touch back. The result is a high-end premium-feel design, even if they're still plastic rather than aluminium. These are arguably the best-looking tablets anyone's made outside of Cupertino. The Tab S comes in two screen sizes, 8.4 inches and 10.5 inches. Both, like their Apple rivals, have the same number of pixels on the large screen as the small. And both are lightweight, catwalk-thin gadgets. Of the two tablets, the 10.5-inch screen is comparable in size to the iPad Air, though the display is almost an inch bigger. Even so, it's lighter (by a whisker) as well as thinner by almost 1mm. So that featherlight, slender quality Apple went for is matched or beaten - not least because plastic is lighter than aluminium. And unlike the Sony Xperia Z2 Tablet which is even thinner and lighter, the Tab S doesn't have a huge bezel round the display, at least not on all four sides. Design-wise, this is a real triumph and anyone wanting a stylish alternative to Apple has found it. The smaller of the pair, the Samsung Galaxy Tab 8.4-inch edition, feels great in the hand. The smooth sides and curved corners, combined with the soft, grippy back create a tablet that nestles in the palm and never feels like its going to slip out. While it doesn't have that premium finish and feel you get with an iPad mini, it always feels a bit safer and managed to come away unscathed from a couple of drops. While the 10-inch version is great for big screen apps and productivity, the smaller Tab S is better put to use watching Netflix, clearer out your Instapaper queue and the like. It's has a more pixel dense display, which is superb and video watching is top notch. If you're more of a media consumer, who's looking for a portable slate the 8.4-inch version is a great choice. Samsung has designed a range of cover accessories with 'Simple Clickers' attachments. These popper-style plastic fittings take the form of spring-loaded holes on the rear of the Tab S. They're secure and effective though take careful placement to click in. Like the Samsung Galaxy 5, the Samsung's new tablet also features a fingerprint scanner - it's not as slickly done as on the iPhone 5s but it's a cool way to unlock the screen without a password. The display - like on the Samsung Galaxy S5 phone - is bright and gorgeous. It's higher-resolution than the iPad Air's Retina display and the Super AMOLED technology makes it stunningly vivid and colourful - sometimes almost too dazzling. But at its best, this is a screen that you can't take your eyes off. Look no further than the 'Wonder of Nature' video that comes supplied. It looks jaw-droppingly good with punchy, sharp colours. Thankfully the tablet is powerful enough to ensure butter-smooth playback, too. Its glorious visuals are not quite matched by audio. There are stereo speakers, one on each of the shorter edges, but you could cover them up with your hands if you don't hold the tablet just right. This is annoying, though it's easy to learn how to hold it best. This being a Samsung tablet, there are plenty of innovations built in, too. Like the fingerprint sensor found on the Samsung Galaxy S5, which offers a simple way to unlock the screen as well as a neat PayPal authorisation method. The truth is it's just not as enjoyable as Apple's version: to use you have to swipe your finger exactly down the home button rather than just resting your finger or thumb on it as you do on the iPhone 5s. It's good, but not as well-executed as it should be - but this is a welcome addition to a tablet, achieved on the bigger screen before Apple could. The tablet also has those Samsung staple features imported from Galaxy S phones: the front-facing camera watches your eyes to know if you're reading the screen and turn it off if you're not. An infra-red blaster in the top edge of the tablet means you can use it as a sophisticated TV remote that you really can't lose down the back of the sofa. You'll also get an 8-megapixel rear camera so that you can take photos, should you really want to. There's Samsung's dedicated TouchWiz menu which swipes in from the side of the screen to offer quick shortcuts to Contacts, Email, internet and more - though frankly it's almost as quick to tap the apps icon that sits on the bottom of the display. And there's the Flipboard personal magazine home screen popularised on earlier Galaxy devices (and still bettered on HTC's phones). Like other Samsung tablets, you can display two apps side by side, which adds to the tablet's versatility. There's no shortage of grunt under the bonnet here, either, making it a fluent, speedy tablet to use. That's down to a Quad-core 1.9 GHz processor matched with 3GB of RAM: more than enough to ensure a whizzy experience that doesn't stutter or slow down however much is going on. The power also means the touchscreen is fast and effective, feeling intimate and responsive. You needn't run out of storage space, either. Although the tablet only comes in 16GB and 32GB capacity models, there's a memory card slot here so you can add an extra 128GB of space on top. This means that even the highest-capacity iPad can't match what's on offer here if you invest in a reasonably priced card. Samsung is generous with its included software. As with the Sasmung Galaxy S5, the tablet comes with a bunch of free software - not the bloatware the company was criticised for in the past but genuinely desirable stuff. So there's three months' subscription to Marvel comics and six months of free Deezer among other offers. These and free games and other apps are found in a widget called Galaxy Gifts, sitting on the home screen just next to the Samsung own-brand offerings such as a video editor, scrapbook, exclusive football app and more. Even here, this feels different from earlier Samsung products because the apps are downloadable rather than stuffed into the gadget already. Of course, it's still hard to avoid the fact that Android just isn't as advanced app-wise as Apple is on tablets. Many apps are sophisticated enough to know how to stretch to bigger screens but few are optimised in the way iPad apps are which reformat in radically different ways. This superior way that apps work on the iPad are one of the things that keep Apple out in front and there's not much Samsung can do to address that. Samsung's Paper Garden is a neatly organised magazine store which tempts you with a wide range of titles (there are some free issues on offer to tempt you more). Some are interactive, with animated covers and effects. All are carefully formatted to fit the 16:9 screen ratio. The pin-sharp screen makes text look as sharp as on paper. Side Sync is a clever feature. Want to see whatís happening on your phone screen without having to dig into your bag for it, or cross the room to where it's charging? Evens answer calls or texts from your phone on your tablet? Side Sync makes that happen. But it's not as smooth as it should be and can stutter to a stop. You can use it with a PC (though not Mac) as well, but again the concept is better than the execution. For now. Kids' mode is Samsung's way of limiting what your kids can use your tablet for is brilliant. It's painfully simple to set up and has enough variety and customisation options to suit the most demanding of parents - or kids. Mind you, you might still prefer to buy them a cheap tablet rather than let them get their smeary mitts on yours. There's no question about it: this is the best tablet Samsung has yet made and it's arguably the slickest, most effective Android tablet available. There are plenty of innovations, from the fingerprint sensor to the click-in covers to protect your hardware. The slim, light styling is a revelation, especially from a company whose design language was limited in its tablets before. Will it be enough to take a chunk out of iPad sales? Apple's sublime ease of use and better range of optimised apps are tough to beat, but this tablet has the best chance of causing a sea change of any Android machine yet.